The most versatile suit in your armoury. Works just as well in the office as it does at a wedding. As with everything else on this list, fit is king. A suit will not fit you adequately straight off the rack. Humans are not uniformly designed; we come in all different shapes and sizes. Get to your local tailor and ask him/her to take it at the sides, taper the leg and make sure it breaks at the shoe. They’ll know what this means. Wear with: crisp white shirt, contrasting tie and chocolate brown shoes. Cary Grant, George Clooney, Dean Martin, Ryan Gosling. What do they all have in common? They know/knew how to rock a grey suit. In every office in the land you’ll find a plethora of grey suits. What separates yours from theirs is the quality and attention to detail. Invest in the fabric (no synthetic fibres), get it to your tailor and look after it. A well looked after suit will last for years. Wear with: white or blue shirt, dark brown or black shoes. Again, stick with safe colours to begin with – grey, navy, dark green etc. Unless you’re wearing a shirt and tie every day, crew neck is a lot more versatile than a V-neck. If money isn’t an option then go for cashmere (or cashmere blend), otherwise merino wool is perfectly suitable. Look at the label and avoid any synthetic fibres like polyester. Wear with: formal shirts or OCBDs. Buy these in white and sky blue to begin with. High street retailers such as Charles Tyrwhitt, TM Lewin and M&S produce decent shirts for the price – many with ‘4 for £100’ deals. Ask them to size you up when you go. Never buy regular/relaxed fit. Wear with: your suits, chinos, blazers. Perfect for occasions not formal enough to necessitate suits. Best to stick with the solid colours of grey or navy, but maybe have a bit more fun with the pattern; maybe get it in check or windowpane. Wear with: chinos. Your summer staple. Preferably in navy, you can go for the marquee brands like Lacoste and Polo by Ralph Lauren, but I prefer the understated look of Banana Republic’s Luxe-Touch polos. You can dress them up by throwing a blazer over them, or wear with shorts and boat shoes when it’s hot. Wear with: sand coloured chinos/shorts, tan brogues. Let’s be honest, these won’t be the most exciting thing in your wardrobe – but they’ll be the most versatile. As you don’t need collar stays they’re very low maintenance. Buy them in pink, sky blue and white. At this point it’s almost become a cliché, but Uniqlo really do the best OCBDs. Wear with: pretty much anything! Get them in charcoal, black, white and navy. If you have money to burn then Sunspel and A.P.C; if not, Uniqlo and the House of Fraser’s own brand, Linea, is the place to go. Get them close to the body, and be careful of the washing instructions, as those muthas will shrink epically in the wash if you don’t. Wear with: any casual item of clothing on this list. Characterised by the v-stitch at the top (originally included to soak up sweat), this is the perfect casual item. Worn by stars such as Paul Newman and Steve McQueen, its beauty is in its simplicity. Wear with: chinos shorts on chilly summer evenings, black jeans or beige chinos and white trainers. Though £80 for a pair of jeans may seem expensive, they pay themselves off many times with all the wear you get out of them. Avoid ‘dad’ colours (and light blue denim until you’re confident enough to pair it with something appropriate) and stick with black and indigo. Don’t buy online unless you know what brand fits you perfectly; get to the shop and try them on. They should be tapered down your leg, and just long enough to add a small turn-up at the bottom. Great high street brands for denim include: h&m, Uniqlo, Zara. Higher up the price scale you’re looking at Acne, Levi’s, Diesel. Wear with: white tee and plain trainers (black denim). Flannel shirt, chukka boots (indigo denim). You’ll be wearing this through most of autumn/winter, so make sure it’s a good un’. Thick enough to keep you warm, looks good done up or left open, durable – it does it all! Wear with: jeans, tees, jumpers, boots. Not as ‘preppy’ as people make them out to be, these will be the most comfortable trousers you own. They could also have been placed in the formal section – they’re that versatile. Buy in sand/beige for the summer months. Wear with: brogues, polos, navy blazer, dress shirts. No, not those crusty Reeboks you have lying around by your footy boots. 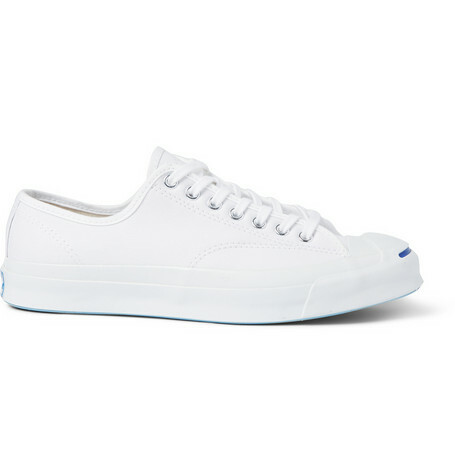 I’m talking the crisp white leather of Common Projects, Axel Arigato, Adidas Stan Smith or Converse Jack Purcell. Only wear them when it’s dry and you’re in urban areas. No running in them! Wear with: black jeans, plain white tee, olive chinos, button down shirts. Bought in brown leather or coloured suede, these are going to be your workhorses. You can buy them in various styles – hi-top brogues, desert, Chelsea etc – but I would advise buying chukka boots in light brown to begin with. They work with most anything. Just make sure you look after them. Wear with: raw denim, flannel shirts, winter coats, chunky knits. If you have money, this is where it goes. Check our guide on shoes for a comprehensive run down, but you can’t go wrong with a solid pair of brown or black Oxfords. For mid-priced look for Loakes; save up for Church’s, Barkers, Trickers and Allan Edmonds. Wear with: all your formal wear. – Socks and underwear. Even commandos don’t go commando. Could you maybe write an article about easy and simple hairstyles?